I kind of miss the nineties cyberspace speculations like the book John reviews here. The Internet turned out to be far more tawdry and commercial than anyone thought twenty years ago. Mindstream indeed. 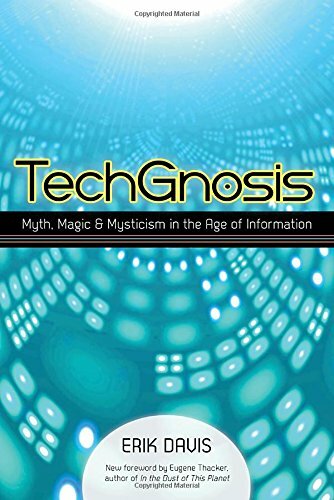 However, once you get past occasional passages like this (as well as such subcultural oddities as “hack” for “invent” and “meat-space” for “the real world”), you will find that “TechGnosis” really does provide a fairly cogent account of the cultural effects of information theory. The Internet is only the most conspicuous such effect, and the author notes many other ways in which the “triumph of technique,” so deplored by Jacques Ellul, both antedated the Internet and provides the context in which it now operates. Nevertheless, the book may be most valuable for explaining why the wired world is so permeated by the weird triumvirate of libertarianism, neopaganism and paranoia. “Gnosticism” has become a cussword, and the author is alive to the need to distinguish the capitalized “Gnosis” of late antiquity from the gnostic-like movements of the spirit that have appeared in more recent times. Still, on the Internet, this is surprisingly hard to do. Researchers into modern occultism have been astonished by the high percentage of their subjects who work in computer-related industries. More significant, though, is the fact that the Internet is a peculiarly apt medium for the expression of the gnostic impulse. Three things that gnostics have always desired is freedom from the constraints of matter, absolute personal autonomy and some species of immortality. Computers and the Internet provide a hope or a simulacrum of all these things. The relation of the Internet to pure capitalism probably does not need a great deal of explanation. There, and maybe there alone, money really is nothing but pure numbers. However, the Internet also hosts its own peculiar ontology. For instance, extropians and transhumanists, the most enthusiastic supporters of artificial intelligence, are working on ways to upload the structure of their brains into computer networks when they die, thus becoming ghosts in the world machine. More prosaically, fantasy-game players and even casual websurfers often create durable online personalities for themselves. These “avatars,” as they are called, can interact in virtual worlds presided over by demiurge-like systems-operators (sysops). These worlds are normally constructed with an eye to sword-and-sorcery fiction, but they are also “magical” for the simple reason that language there really is performative: typing in a “spell” will invoke some “law” of the virtual world. This is the essence of magic, which the technology merely facilitates. Serious gamers, and the numerous serious ritual magicians (“chaos wizards”) who communicate online, do not strongly differentiate the online worlds from their own carefully-cultivated imaginations. This degree of freedom from the human condition has its price. When matter and social norms become fetters that can be cast aside for brief periods, the question arises of who forged them in the first place and who maintains them now. This paranoia was characteristic of ancient Gnosticism, and it is typical of much of the Internet today. Rumors of all sorts spread instantly and universally, each depicting some yet more subtle strategy of oppression deployed by the dark controllers. In a purely mental world, after all, all control is thought control, so the conspiracy theories most characteristic of online culture tend to smack of the blackest spiritual wickedness. Among the archetypical themes to which information culture gives new body, not least is the apocalypse. Teilhard de Chardin has become the patron saint of philosophers of the virtual world, for the excellent reason that his notion of a “noosphere” really does bear a striking resemblance to the Internet. (The fact that he shared Henri Bergson's doubts about the possibility of artificial intelligence is often overlooked.) Teilhard's theology of history has more than a little to do with the widespread belief that the virtual world is moving toward a Singularity in the next century that will absorb the material world and end history as we have known it. There are also many less cheerful apocalypses involving aliens and the traditional international cabals. On the other hand, of course, the online world is host to quite traditional forms of premillennialism. Indeed, though every variety of radical thought can be found on the Internet, I for one have long been struck by how conservative most of its content really is. This review first appeared in the May, 1999, issue of First Things.